The Empress of Time inadvertently triggers a malfunction that causes different time intervals and parallel worlds to intersect. You are an adventurer who is unwittingly sucked into this time spiral. Your objective is collecting a form of energy called mana and bringing the world back to order, allowing you to return to your own time. We’ve also made a huge improvement to the Grid system with a lot more options for you to choose from. Try it out and let us know what you think! We are also investigating various networking solutions to improve the netcode. Some of the improvements would be network stability, connection issues, voice chat, bandwidth reduction, security, and server browser issues. If we find a good solution, this would be a major change to the game and will take a lot of time to develop and beta test to ensure stability. Khronos Hunter by Sorisuto is now available with a 15% launch discount! Designed by Hiroyuki Okinoi, this game is published in a Japanese / English edition. Scorecard is scripted and coin values are automatically calculated. Notification banner that you are close to winning if you reach 100 points. Grid projection needs to be turned on via toggles for individual objects, but will always project onto the tables. Updated the grid ui to include a lot more options and improved visual look. In addition to the old horizontal hex grid, you now can use a vertical hex grid. You can now change the color & opacity of the grid. 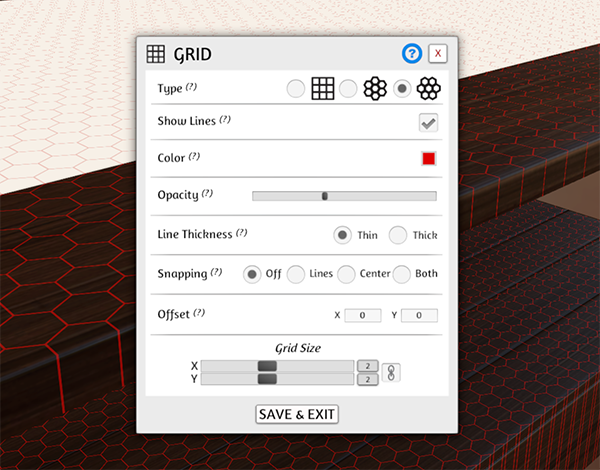 You can now choose between a thin or thick grid line. Line snapping has been added to the hex grid. Fixed hex snapping issue with offsets. Fixed box snapping issue when dropping object in same spot. Added new 2D pointers for the Gizmo, Snap Points, Decals, Vector Paint, & Zones. Updated 2D pointers for Joints and Rulers. Removed the mini fog icon when in the Zones mode since there is a new pointer (2D pointer only). You can now differentiate between the Vector Paint and the Pixel Paint tools. We plan on updating the 3D pointers as well in the near future. Custom Infinite Bags will no longer load the infinite object into memory. Reduced network bandwidth of infinite objects. Added ‘delete all’ to Decals. Fixed issue with decals on infinite objects breaking. Fixed decals not hiding in the hand. Timers are much more optimized. Added color and font_color to ui buttons. Added alpha to color table values accessed with either “a” or 4 entry. Added grid_projection object member variable. Fixed issue with timer not cleaning up correctly and other bugs. Increased history log of chat window to 400 messages. Eliminated lag when changing tabs that have lots of chat entries. This change should prevent those who would sometimes crash at launch with the old intro video. Less annoying sound and more minimal fade in and out. Made it easier to update your workshop mods by adding an easy way to get your ID in the Update Workshop section. Mousing over 3D buttons will not show an icon like it does for bags, Assetbundles, etc. Reduced stuttering caused by Gizmo tool. Added DirectX11 launch option (beta). 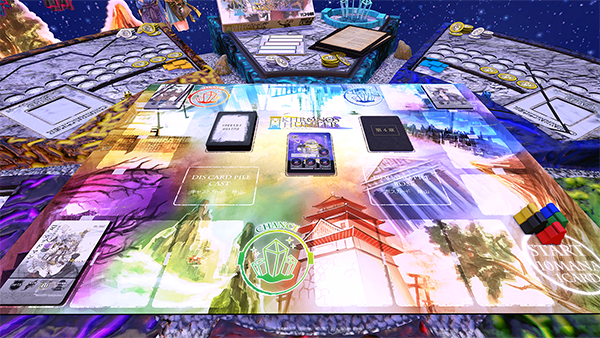 Updated Warfighter so that the tokens in the two boxes are now facing the player names. Fixed skip empty hand in Turns. Fixed bb code name exploit. Fixed issue when saving a hidden object, it would reveal its name in the input field.